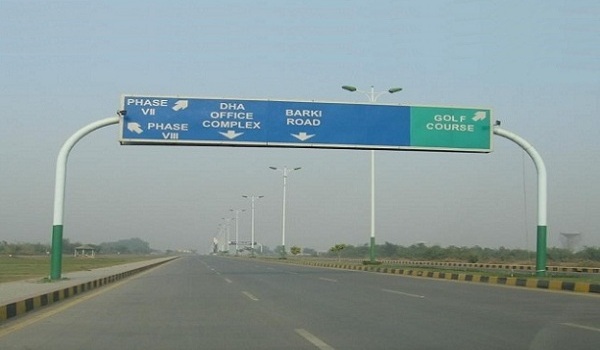 How did DHA Lahore Phase 7 perform in 2014? DHA Lahore is the undisputed king of the city’s real estate market. It is also true to an extent that large-scale real estate investment in the bigger cities of Pakistan is not something just any investor can pull off, and this is particularly true for DHA Lahore, where the average per-marla rate of residential plots is over Rs 920,000. Among DHA Lahore’s many phases, Phase 7 is a popular one. According to Zameen.com’s search trend stats, it occupied the second spot on the list of most-browsed DHA phases on the portal almost throughout 2014. However, despite being a popular phase, where possession for many blocks such as Block F, Q, R, T, U and W has been handed over, the property rates there haven’t increased as much as the investors expected. If you looked at a map of DHA Lahore, you would perhaps feel that from among all other DHA phases, Phase 7 is located farthest from DHA’s centre. However, the grand Barki Road and Lahore Ring Road have made this distance meaningless. Why have property rates there not increased as much as other phases, then? It is, I believe, the recent launch of several new DHA projects where the comparatively more affordable rates have attracted investors galore, who obviously see bigger gains in investing in comparatively cheaper property in DHA Lahore. However, the situation in Phase 7 was far from dismal in 2014. If everything I’ve stated above makes it seem like 2014 was a completely neutral year for DHA Lahore Phase 7 and brought no or insignificant price rises for property there, maybe the following stats will change that. At the beginning of 2014, the average value of 10-marla plots in DHA Lahore Phase 7 was Rs 5,594,275 (please note that the rates of plots whose possession was available back then were considerably higher, as high as Rs 7,000,000 in some blocks) and by the end of 2014, their value had increased to Rs 5,996,364, an annual price rise of 7.19%. Here is the graphical representation of how 2014 has been for 10-marla residential plots in DHA Lahore Phase 7. For 1-kanal residential plots in Phase 7, 2014 started off with an average sale price of Rs 9,878,484. These plots gained in value slowly yet steadily and by December 2014, their average price had increased to Rs 10,332,017, a price rise of 4.59% over one year. 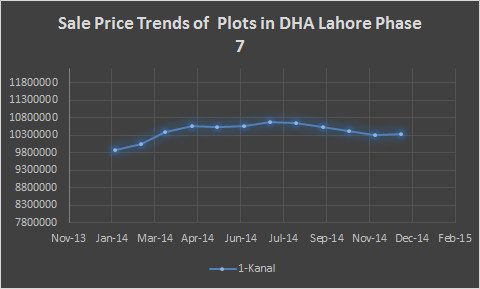 This graph offers a glimpse of the price trends for these 1-kanal plots in 2014. 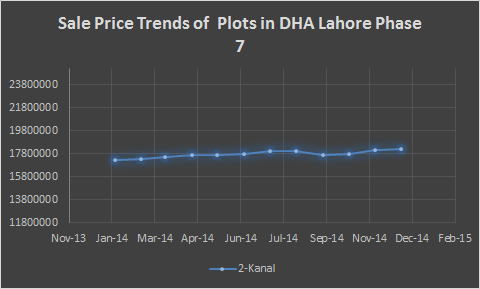 The average sale price of 2-kanal plots in Phase 7 of DHA Lahore in January 2014, per Zameen.com’s stats, was Rs 17,276,000, which increased steadily during the year. By the end of December 2014, their value had increased to Rs 18,577,306, an average price rise of 5.55%. According to Zameen.com’s search trends for January 2015, the top 3 most popular blocks for residential plots in DHA Lahore Phase 7 were Block Y, Block U and Block W.
If you would like to add something to this analysis or ask me something about it, please use the comments section below and enlighten me with your thoughts.